We'll give you three guesses what it was, but you'll only need one. 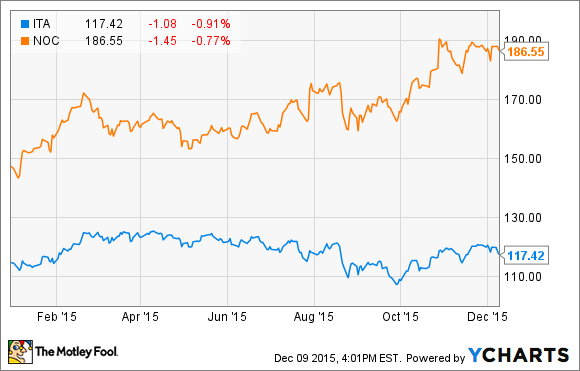 Performance of Northrop Grumman stock versus the ITA defense ETF in 2015. Data by YCharts. 2015 was a banner year for Northrop Grumman Corporation (NYSE:NOC) -- and for the investors who own it. Although war in Crimea and Syria, and threats of conflict to come in the South China Sea, worked to drum up business for many weapons makers, 2015 actually turned into something of a disappointment for defense investors. To see why, you need only look at the iShares Dow Jones US Aerospace & Defense ETF (NYSEMKT:ITA). So far this year, the Aerospace & Defense ETF is up less than 1%. Not so Northrop Grumman. Northrop stock is up 30%. Some credit for this goes to Northrop's hard work squeezing blood from a turnip -- or money from a defense budget caught between a rock and a hard place. Last quarter, Northrop managed to grow its profits 9% despite revenues that were essentially flat year over year. But for the year as a whole, Northrop has struggled to maintain momentum, with S&P Capital IQ showing modest declines in both sales and revenue year to date. So what explains the rest of Northrop Grumman's outperformance? Three words: the B-3 bomber. Technically termed the Long Range Strike Bomber, or LRS-B, America's newest strategic nuclear bomber is fast attracting the moniker of the "B-3 bomber" -- not least because Northrop Grumman built its predecessor, the B-2. In October, Northrop was tapped to build the B-2's replacement, a $550 million war-making machine for the 21st century -- and its stock has gone on a tear ever since. According to our latest calculations, Northrop Grumman is likely to capture something on the order of $79.2 billion in revenue from the B-3 bomber contract, counting both research and development work and production costs for delivering 100 aircraft to the U.S. Air Force. Potentially, the Air Force could double its order, pushing the total program value up well past $120 billion, and producing perhaps $10.5 billion in net profits for the defense contractor. Granted, none of these profits are certain yet. It's not certain that Northrop will be able to achieve 8.5% profit margins on the B-3, as it's done elsewhere in its defense business. It's not even certain that Northrop will get to earn any profits at all on this contract -- because rival bidders Boeing and Lockheed Martin are sorely upset at having lost their bid to build the B-3, and they're protesting the Air Force's award of B-3 to Northrop. But assuming Northrop beats back its rivals, retains ownership of the contract, and is permitted to proceed with production, the B-3 promises to be the most important contract won in 2015 -- or in many a year. Best case, $120 billion-ish revenues will cover Northrop Grumman's entire revenue stream for more than five full years of work. Worst case, $79 billion is still good for about three years' revenues. So if you ask me what was Northrop Grumman's best defense contract in 2015 -- this was it, hands down.